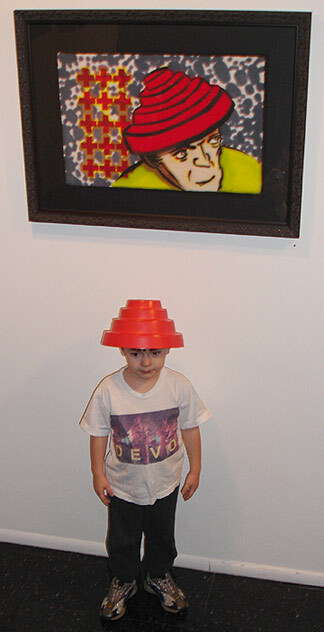 Liam Royster, standing on the front lines of the next generation of DEVO fans, wore his Energy Dome and custom-made DEVO tee to the OX-OP reception. He and his family traveled to Denver, CO from MN this year to see DEVO perform live. 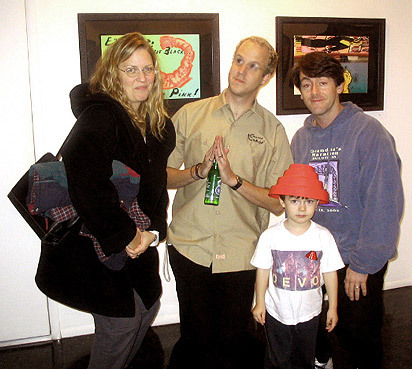 "He doesn't even know what the Rugrats are, " said his Dad, "He's all about DEVO!" Seen here with A: We're All Devo". Here Liam singing Ton o' Love, Gates of Steel, and here him mimicking Jerry's final word in Mongoloid. Here's a photo of me with Liam and his family, Betsy & Sean .